Indo-U.S. Science and Technology Forum (IUSSTF) celebrates its 18th Foundation Day The Indo-US Science and Technology Forum (IUSSTF) celebrated its 18th Foundation Day on 21st March 2018 in the presence of the Union Minister for Science & Technology, Earth Sciences, Environment, Forests and Climate Change, Dr. Harsh Vardhan, and the Ambassador of the United States to India, Mr. Kenneth Juster at New Delhi. 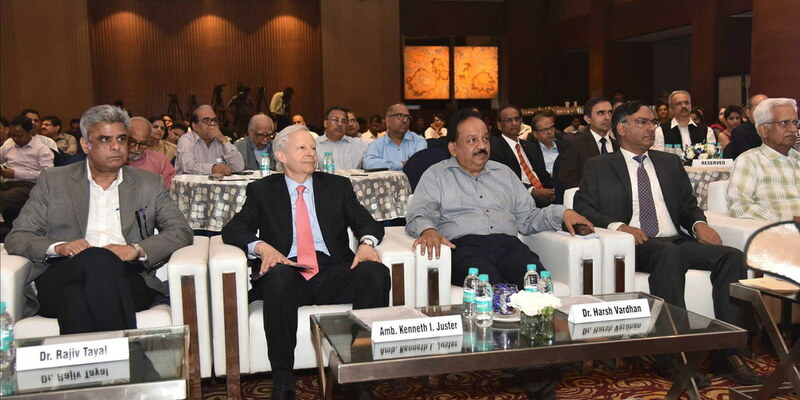 In his address Dr. Harsh Vardhan said, “Indo-U.S. Science and Technology Forum has contributed immensely in bringing both our countries closer together and has clearly demonstrated that cooperation in science and technology is driven by leveraging intellect, innovation and technological strength of both our countries that directly contribute to global knowledge economy of 21st century” The foundation day also showcased an exhibition, highlighting the achievements of IUUSTF through its researches and programs in the various fields of science and technology. The exhibits included low-cost portable innovations. One such innovation was auto refractor, which helps eye care professionals to quickly diagnose the problem and prescribe eye glasses. On the occasion two books of IUSSTF were released, these were: Building Scientific Networks- IUSSTF Funded workshops 2014-2017 and IUSSTF Joint Centers- Creating Virtual Partnership were released. The first book provides details of various workshops done by the forum between 2014 and 2017. The other book highlights the partnerships between IUSSTF and various research organizations and laboratories in India and the United States of America. IUSSTF mission to excel in the field of Science, Technology and Innovation provides a great platform for students and scientists across the two countries to collaborate and develop creative inventions for the betterment of the society. The genesis of IUSSTF can be traced back to the year 2000, when after nearly five decades of the India-U.S. relationship in S&T, the Governments of India and the United States of America decided that it was time to create a more formal mechanism to take this long history of productive engagement to the next level. This led to the formation of the binational Indo-U.S. Science and Technology Forum. IUSSTF’s mandate is to promote, catalyze and seed bilateral collaboration in science, technology, engineering and innovation through substantive interactions amongst government, academia and industry. The Department of Science & Technology (DST), Govt. of India and the U.S. Department of the State are the two nodal agencies of the respective Governments handling matters related to IUSSTF. In 18 years of its existence, IUSSTF has developed an evolving program portfolio largely conceived and driven by the scientific community from both countries. IUSSTF-supported activities have led to the direct interaction of over 20,000 Indian and American Scientists and Engineers. IUSSTF currently implements a portfolio of “four” broad program verticals - Scientific Networks, Innovation and Entrepreneurship, Research and Development and Visitation Programs. Scientific Networks comprise of short-term engagements such as Bilateral Workshops/Conferences/Symposia as well as medium-term arrangements through Virtual Networked Joint Centers that aim to encourage collaboration in topical areas of mutual interest. More than 340 Workshops and 78 Joint Centers have been supported thus far. The Innovation and Entrepreneurship vertical comprises primarily of the hugely popular U.S.-India S&T Endowment Fund (USISTEF) that provides grant-in-aid support (up to INR 25 Million / USD 400,000 approx.) through a highly competitive process, to commercialize S&T-based innovations with significant societal impact. USISTEF has supported 27 projects over the last 6 years at a total investment of approximately INR 609.69 Million / USD 94, 00,000, in the areas of affordable healthcare, safe drinking water, clean energy and environment, livelihood enhancement, women’s empowerment and financial inclusiveness, amongst others. 12 products have since been commercially launched. In an effort to address the issue of skill development and capacity building in all areas of science and engineering, IUSSTF currently administers 15 Visitation Programs across disciplines and stakeholder levels and close-to 1500 Interns and Fellows have been trained over the last 10 years.